Sometimes on working days, you feel drained out of ideas, or stressed to have a new idea altogether. Maybe you feel so tired to work on something, because work is not always interesting. When the monotony of the day gets into you, why not explore some work memes and refresh the mood? If you are wondering where to get such awesome, mood elevating work memes we have got you covered. In this article, we have compiled a list of 10 work memes that will set your work mode on. Here are the 10 best work memes to help you get through the working week and cheer you up to get going. The look of surprise on the boy’s face. Lol! That is exactly how people feel, when they are stressed at work and think it’s been forever they are at work, but actually it’s only a couple of minutes. This work meme literally made us laugh. Every minute seems longer at work and it’s funny that the meme says a cupcake is badly needed to lift the work mood. Work memes like this are so relatable. All day the boss didn’t realize something important and the moment you are about to step out, he stops you and probably assigns a work that will take ages to complete. This meme describes, you giving a damn to whatever problem is happening at work. Because even after repeated reminders to fix the issue, nobody paid attention. So, now is your turn to just chillax! Work memes like this are sarcastic. 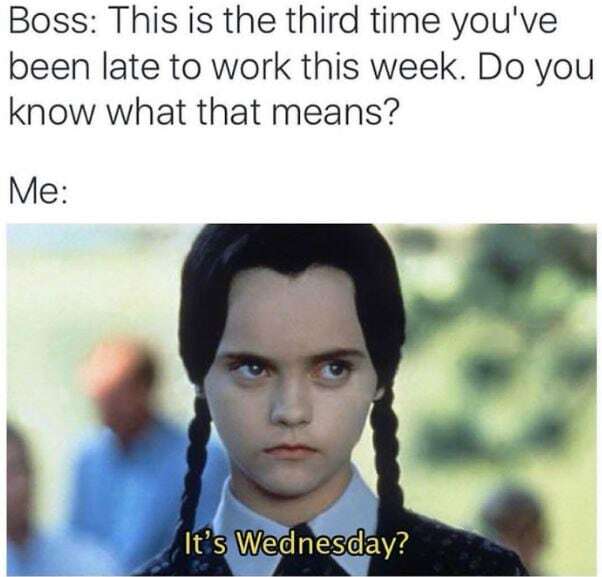 When your boss asks that you are late for work third time in the week. Your obvious response is mentally replying is it Wednesday? When you don’t get enough sleep, you just crave to crash on your bed. So this funny meme depicts, to get your dream job wear a dress with fixed pillows and quilt and get ready to start working, err! Sleeping. Pay day is happiness and shock! After getting your salary has been credited text, next you receive the upcoming bills, rents etc. so, it’s not you who actually got paid, but your bills! This work meme is epic. People usually get annoyed by people and revolt, but at the work place they need to tolerate the undesired behavior and bossy-ness. There are moments at work, you are really tempted to blurt out something, but you keep quiet, to avoid the repercussions. The dog’s expression in the picture is worth a laugh. When you keep on reminding people to acknowledge your work email, but they don’t. You send follow up email to tell them, that your job is done. If you want to make hilarious work memes, then don’t hesitate to adopt Filmora meme maker. It is totally free without any watermark on the meme. You can create image, GIF and video meme using this program. Moreover, you can include videos in your meme using this work meme maker. You have the customized output format feature that allows you to get a video turned into GIF. You can add text, change fonts and move the text anywhere around the meme.